Have you ever run out of memory on your iPhone or iPad while trying to capture the perfect photo or download a movie or app? Leef iBridge 3 external IOS memory drive empowers users to go do more by freeing up space on their iPhone & iPad. 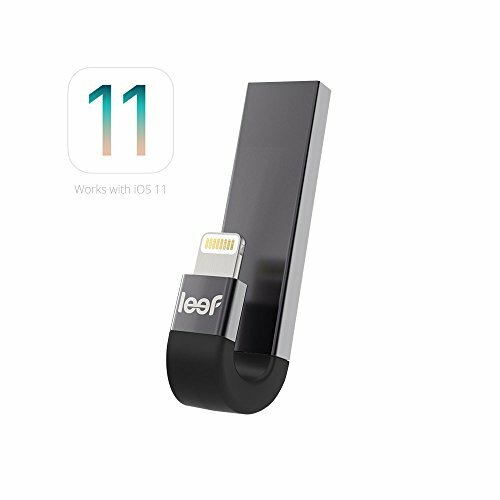 Compact with its patented j shape, Leef iBridge 3 easily wraps behind your phone and is compatible with all lightning enabled IOS devices. It works together with the iBridge 3 app and gives you more space to create, more power to share, and more time to enjoy life's adventures. Features overview: File transfer of photos, videos, and documents. Automatic backup of contacts and content between IOS devices, your mac, or pc. Direct-to-drive photo/video capture. Storage and direct playback of music & videos from Leef iBridge 3. Content protection with new security feature Leef lock. Easy to carry holster cap included in box (attached to keys). Compact with industry-recognized and patented j shape. CONVENIENCE: The iBridge 3 allows you to automatically backup content and contacts so you never lose your essential data. STOP SAVING TO YOUR PHONE: Shoot photos and videos directly to Leef iBridge 3 so you never miss the moment. STAY ORGANIZED: Easily create an external library of your media for quick access without taking up space on your iPhone or iPad. STAY SECURE: Create a passcode (or use touch id) with Leef lock to ensure all your content is protected, even if your drive is lost or stolen. SLEEK DESIGN: The sleek design fits seamlessly into your phone for style and convenience in one. If you have any questions about this product by Leef, contact us by completing and submitting the form below. If you are looking for a specif part number, please include it with your message.